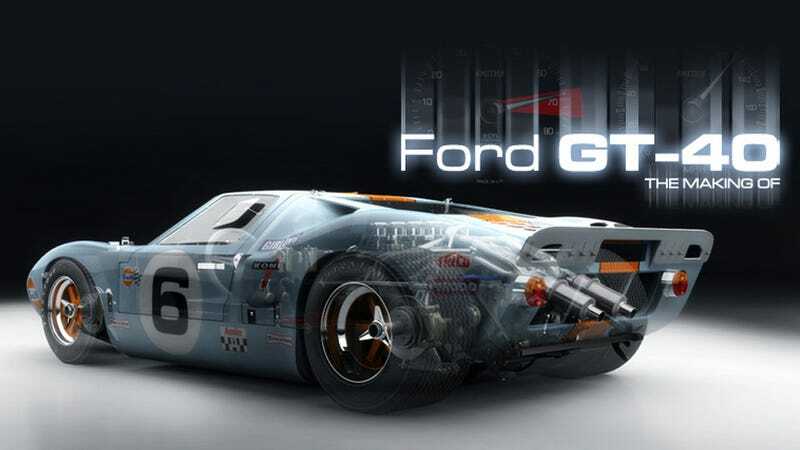 Digital artist Luis Nieves wowed us last week with a rendering of the iconic Ford GT40 in Gulf livery so realistic we said it would make you dream in pixels. Honored by the strong response, Nieves agreed to share a step-by-step guide of how he built this impressive car in the digital realm using Maya, After Effects, Photoshop, and a ton of research. — Ed. I wanted to push myself on how far I could go, so I decided to build a piece capable to make an art statement; I didn't want to feel that it was just another 3D model. Being an automobile nut, I, like some of you, have had the idea of building a car from the first to the last bolt. I find out that for this task a good set of blueprints is never enough. I spent around a week collecting photographs before the beginning of the modeling process, and I was still collecting references at the end of the texturing and rendering steps. All digital renderings copyright Luis Nieves. I usually try as much as possible to start from spline cages. It comes very handy to have a tridimensional blueprint of your model; it will guide you making decisions about size, position, and where your components should be organized, even before you model the shell. The next step was modeling all the components that have direct relationship with the chassis. I always started creating primitives to establish rotation and proportions, and then I went in detail using pictures. Here once more I used techniques like nurbs revolves, lofts and extrusions than later on turned into polygons. After I finished all the components, I moved to the interior. As you notice, at this point I already started a rough lighting & rendering process. It is a good idea to shade with a high specularity material, so your mistakes show up and all the annoying bumps and pinches are easier to identify and clean. It is time now to start with the body shell panels; these are the visible parts of the car, those that sell your model and where you can't lie. In this particular case, the blueprints had a chronic lack of precision, so I decided to setup several cameras using the tumble, track, dolly, zoom and roll options. By watching image planes through different cameras, it gave me a far better approach to the real deal than just my blueprints. I modeled the body as a whole and then broke up the panels following the design. I always manage my work as a pipeline; I set a direction to follow and I stick to the rule until I finish every face of the project. For instance, I don't shade my model if it's not completely done. To start another level of the job is distracting, so it is important to keep my attention and efforts always pointing to my north. The texturing process was again based on more or less 120 pictures I collected. It was very important for me to portray the real car in high detail, so I made all the logos, titles in the cables, decals, dials, tags and stickers that every object required. I even painted some chalk writing on the tires, dirt and scratches here and there to get rid of the CG look that sometimes is too perfect. For the rendering process, I used Mental Ray Image-based lighting. The reflections, light and color are coming from a HDRi picture set I recently shot in Vegas. I placed a chrome sphere within my mentalrayIblShape node to test my settings (be sure the reflections are facing the right direction). I used the camera tools I mentioned before to match my car and the back plate shot in terms of perspective and size. The result I achieved is coming directly from MR, I didn't make passes or compositing. Finally, I added some post production enhancement and color correction using Adobe After effects.